Conference attendees are often inundated with new and innovative ideas from speakers and breakout sessions. Not to mention the onslaught of goodies and giveaways they’re assaulted with as they move through the trade show floor. You can breathe new life into your trade show promotional campaign by following these tips and the savvy moves of companies that have figured out how to put some swagger into their trade show plans. What are the secrets to standing out from the crowd of clever tag lines, bold t-shirts, and branded toys? While this seems obvious, many companies have fallen victim to the “me”-centric trap. Instead of thinking like a customer, businesses get caught up in clever ideas. So while a stand-out message on a clever coffee mug might seem like a brilliant idea, your target customers may already have 20 mugs in their cabinets. While the product needs to be something customers want, it also needs to stand out from the crowd. View the experience from the attendee’s point of view. As one moves past a sea of trade show booths, what will cause him or her to pause and stop at your table? Packaging? An eye-catching gift bag? The product itself? Demos? What should you do if you don’t have a large promotional product budget? That doesn’t have to necessarily mean the end of the game for your business, or that you’re doomed to give away cheap chotskies. Invest in a quality company t-shirt and have your team members wear the shirt throughout the day. As they move in and out of sessions and interact with trade show attendees throughout the day, your company gets exposure too. It’s like a walking billboard – on the cheap. Simple, innovative ideas will put your small budget to better use than investing in cheap products that no one will ever take home or remember. Aside from the swag bags that are given away at trade shows and conferences, businesses must compete with giveaways at booths, too. That’s a lot of “noise” to break through. 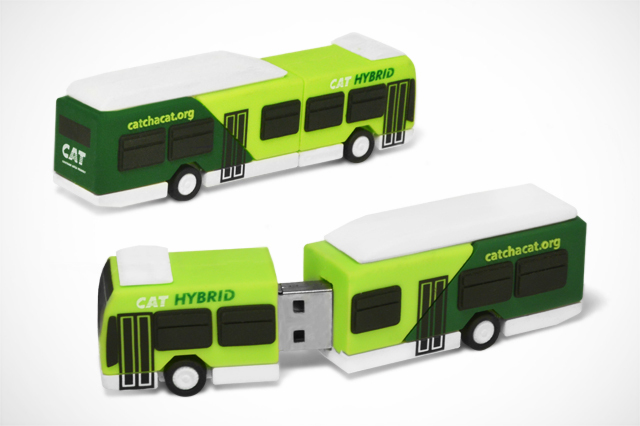 Consider going digital and handing out a Custom USB with access to apps, downloads, and graphics, or giving away printed solutions with downloadable assets. A long-time complaint about trade show giveaways is waste. Your business can run counter to this culture by giving away “green” options. Your booth can gain a lot of traffic by holding a contest and letting attendees vote on the best charity to which you will donate funds. Just make sure the charity options make sense for your brand. You may also consider choosing eco-friendly promotional products made from wood, bamboo, or recycled paper pulp. Stand out from the rest of the trade show booths and create a game. Give attendees the opportunity to have a little fun while collecting critical information you want to put into their hands. Come up with a name for the campaign, and give prospects hints about locations throughout the trade show where they need to go to pick up the next piece of the puzzle. Have prospects collect something as simple as key chains at each location, with each one representing a letter or two of the word. Once they’ve collected all of the pieces and guessed the word, they can trade it for a larger prize: it can be a one-of-a-kind custom flash drive that contains key information about your brand; or perhaps an item that your prospect will find to be useful, like a personalized power bank, a pair of custom shaped earbuds, or another unique mobile accessory. Giving away useful products increases their chances of being kept, utilized, and seen by more people. A Dutch company created a promotional cling for car insurance client Novocortex. The company gave away the clings to customers in order to “prank” their friends. Once the cling was applied to the vehicle, it made the car look like it had a giant dent or scratch. This quickly got the attention of consumers, who upon closer inspection, discovered the cling, along with Novocortex’ contact information. This is perhaps innovation, humor and relevant branding at its best! A great example of a relevant promotional product that gets its brand message across, too, Iams, an Australia-based dog food company, created Frisbees in the shape of a barbell weight. The promotional product was an apt visual representation of what the dog food company promised it would do for its patrons — build strength. Another marriage of comedy and promotional product branding, D.D Drin Insect Elimination Company created a prank campaign with a promotional product that looked like a roach. They took the promotional product door to door, slipping the despised insects under prospects’ doors. When the homeowners found the bugs and flipped them over, the company showcased its contact information and a message about how easy it was for the bugs to gain entry into homes. A custom promotional product tends to command attention, like Alzheimer’s New Zealand’s campaign to “erase” Alzheimer’s. Instead of passing out a flyer, they created custom flash drives in the shape of an “eraser.” Once a prospect inserted the USB into a computer, it opened up to information about Alzheimer’s that the association wanted to get across to conference attendees. Investing in a strategic list of targeted leads can pay off when you tailor promotional products to meet the needs of that audience. Instead of handing out tons of $1 items, a pizza company created customized pizza boxes with a pizza cutter inside and sent one to key people on their target list. The company was 100 percent successful in securing an appointment with each lead, all because of an innovative, customized approach to promotional marketing. With a little creativity and a lot of effort, you can put the magic back into your promotional event campaign and really wow attendees with your offerings. Keep the secrets to success in mind, and give people something they really want. Put your money to good use, consider digital assets, and go green. Finally, take inspiration from some case study success stories to put your promotional event strategy into overdrive.